Ever since I started working full time I’ve noticed that sometimes (despite even thinking so) you make up won’t last all day. 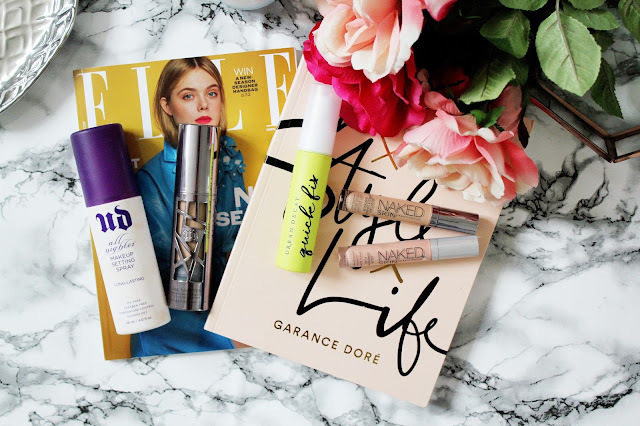 I didn’t notice until recently that all of the base products I use are actually from Urban Decay so I thought for today’s post I’d talk you all through what products I use on a daily basis to sort out my base make-up as I am super happy with how these products make my skin look and the Urban Decay All Nighter Foundation seriously lasts all day! 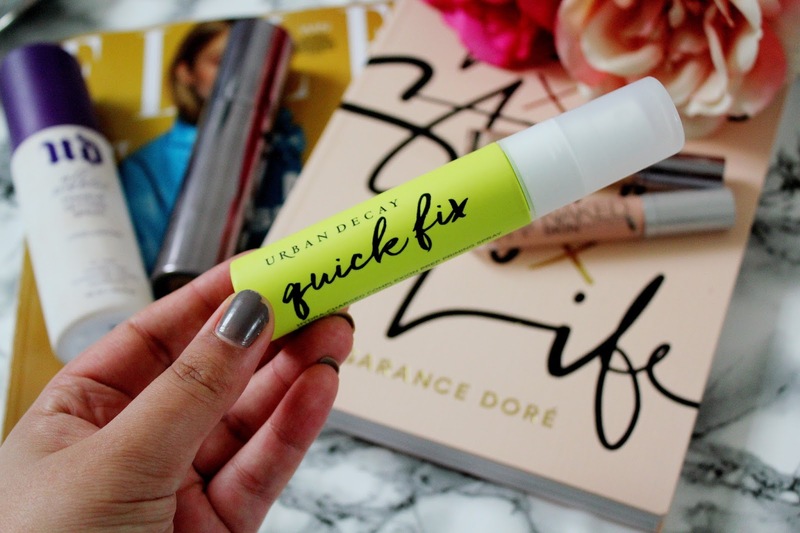 This is the newest product from Urban Decay, which I have been using, and I absolutely love it. I’m a big fan of the Smashbox Photo Finish Radiance Primer and use it pretty much everyday but on the days when I don’t have as much time to get ready, I needed a quicker option and this spray works like a dream.This is a soothing prep priming spray which helps smooth my skin, brighten my skin and make my skin look more moisturised. This spray has been created in partnership with Skindinavia and it’s inspired by the Korean water trend which makes this spray even more hydrated then the B6 Prep Spray. I use 3 or 4 spritzes of this before applying my foundation. I only have the travel size at the moment but I’ll definitely be purchasing the full size version when this runs out. If you’re a sufferer of dark circles then this product will revolutionise your life. This range of colour correctors is relatively new from Urban Decay and I was drawn to the shade peach as it helps brighten the skin and hide dark circles. After I’ve applied my foundation, I reach for this and dab a small amount on my dark circles under my eyes and blend in with a Beauty Blender and they immediately disappear. 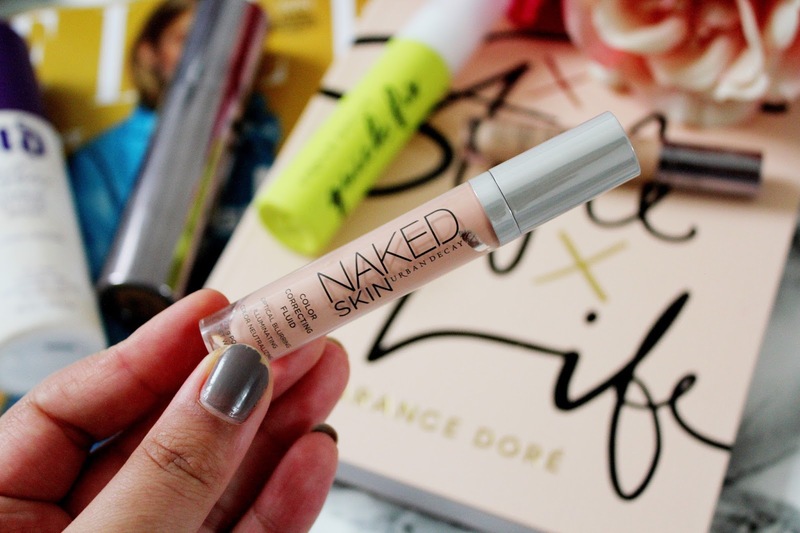 After using the colour correcting fluid in peach, I reach for my all time favourite concealer, which is the naked skin concealer, and I’ve gone through about 4 or 5 of these now! 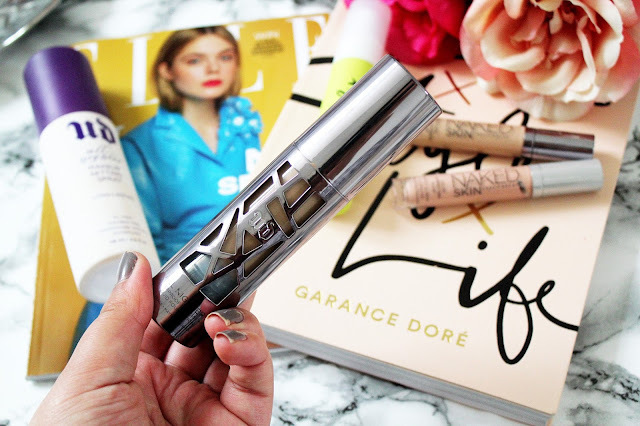 I even wrote a post about how much I love this concealer here. I use this concealer everyday and absolutely adore it. It’s so easy to apply, high coverage and doesn’t crease under your eyes. I use this on top of the colour correcting fluid and my eyes are left looking glowing and brightened after using this duo. Lastly, to make sure my make-up stays in place all day, I reach for my all nighter setting spray. 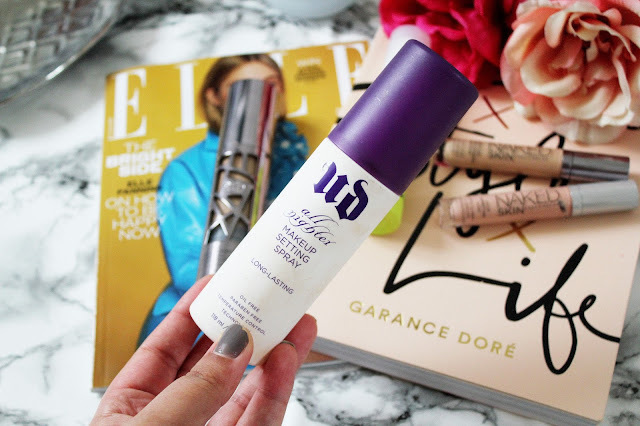 I’ve tried so many budget setting sprays (the NYX one is quite good) but nothing has really compared to this spray from Urban Decay. It’s very light on my skin, It makes me feel like I’m not wearing much make up, my skin is left feeling hydrated and my make up lasts all day. What else do you need from a setting spray?! What base make-up products do you use? Have you tried any of these products from Urban Decay? 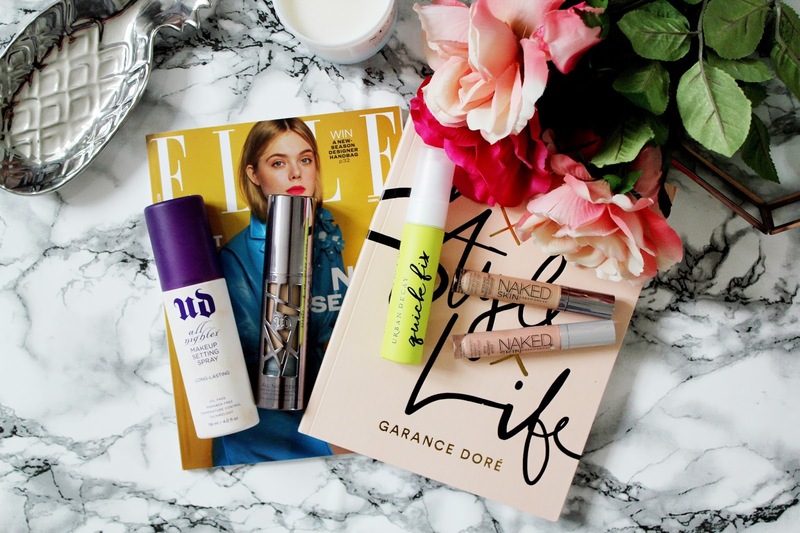 Great post - I have never tried anything from urban decay but might need to give it a go! 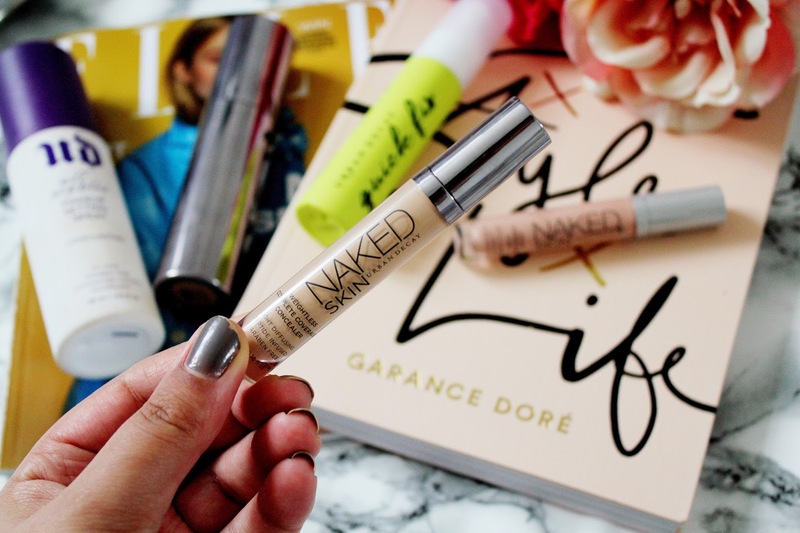 once again feeding my urban decay obsession with this post! 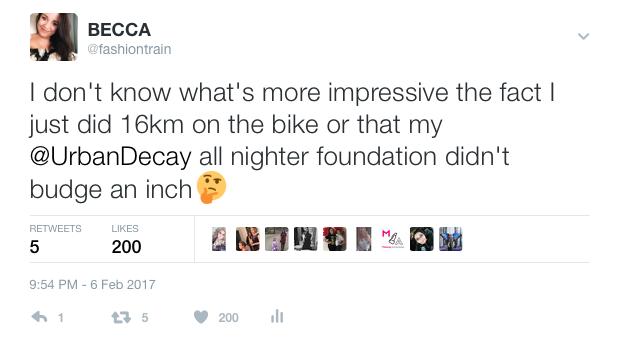 i feel like the only gal on earth that doesn't get along with the all nighter; i think its because im obsessed with the naked skin foundation, its a medium coverage but i build mine heaps (means my bottles don't last very long but its so worth it) and when i tried the all nighter i just found it to be to gel based for my liking! DEFFO going to try the colour correctors i've had my eye on them for so long, my next payday treat! !